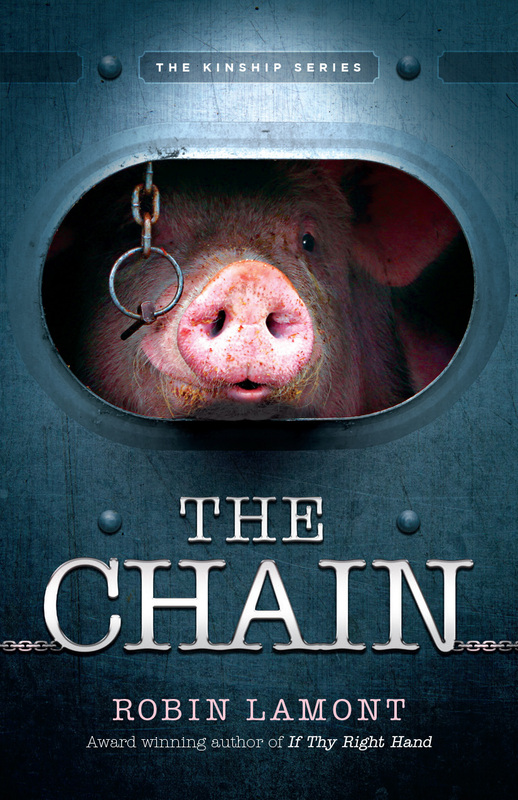 Here is a book that I didn’t want to read: The Chain by Robin Lamont. When someone hands you a book with a cover photo of a pig peering through the bars of a transport truck – with a title that takes on a foreboding meaning in that context – you don’t want to read it. You just don’t. And the nail in the coffin is the subject matter itself: a fiction novel set in and around a commercial slaughterhouse. It’s a hard sell. This is what makes Lamont’s accomplishment in The Chain so masterful. With a cover image, a title and a subject matter that would turn any reader away, this reader was hooked by the end of the first chapter. I had to keep going where the bait took me. The Chain reads with the flow and intrigue of any good novel, yet accomplishes this while luring the reader into the most repellent of places, without the least disguise. Disarmed as we are by fiction, Lamont swings open the slaughterhouse doors and we follow like sheep to the slaughter. But the slaughter will not be ours – Lamont invites us in as observers to slaughter, the slaughter of pigs. How she manages to craft a captivating fiction out of this is a question one can only answer by reading the book. The lead character is an animal welfare investigator named Jude Brannock. After receiving a tip about cruelty to pigs at a large-scale slaughterhouse in a small rural town, she travels out to investigate. What she encounters is secrecy, corruption, intimidation, and a town of well-meaning people held ethically and financially captive by their dependency on the income that comes from an industry of killing. As Jude probes after truth against tremendous resistance, the reader is drawn empathetically not only into her experience but also into that of slaughterhouse workers, their spouses and children, and even the people along the corporate ladder trying to protect their jobs and profit margins. Each character is given full flesh, a history, an emotional life, vulnerabilities and moments of triumph. No character is hollowed of humanness, so the reader can not resist empathy towards all. Given the context, this is no small accomplishment. I was at the conference to speak about my mother’s book, Suffering Eyes: A Chronicle of Awakening. In preparing for my talk, “The power(lessness) of words and art in animal advocacy,” I had wrestled with – agonized over – the role of words and art, their powerlessness, irreverence, blasphemy even, in response to the immediacy of suffering. Through all of this I found my way to an understanding of their power, but there were burning questions in my mind that I had not found answers to, which left me troubled and unsatisfied. Deepening the emotion and connection to universal feelings draws your listeners and your readers in even further… Now that’s a story that may make people see a homeless person curled up on a subway grate with an animal in a different way. It may even inspire them to do more than just walk on by. Lamont does not simply describe the power of storytelling, she demonstrates it, and this is precisely what she accomplishes in The Chain. By connecting with her characters we are drawn into the story, and having our curiosity hooked – so to speak – we find ourselves wanting to know. What is happening here? What is the truth that is being hidden from us? Curiosity is powerful, we are overcome by it easily, and it is all the more powerful in that it makes us open to knowing. 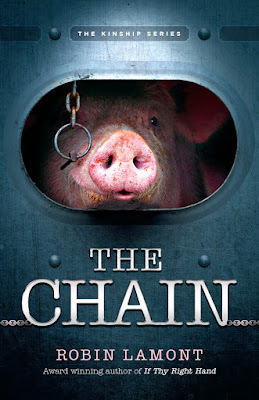 In The Chain, Robin Lamont delicately and purposefully puts fiction to work for animal advocacy, making the reader open to knowing the truth behind the fiction. Carried along on the current of her storytelling, we find the answers peering through.